Heat oven to 350°F. Grease 15x10x1-inch pan with shortening. In large bowl, mix all base ingredients except butter. With pastry blender or fork, cut in butter until crumbly. Press mixture evenly in bottom of pan. Bake 8 to 14 minutes or until golden brown. Remove partially baked base from oven. Sprinkle peanuts and chocolate chips over warm base. In small bowl, mix caramel topping and 3 tablespoons flour until well blended. 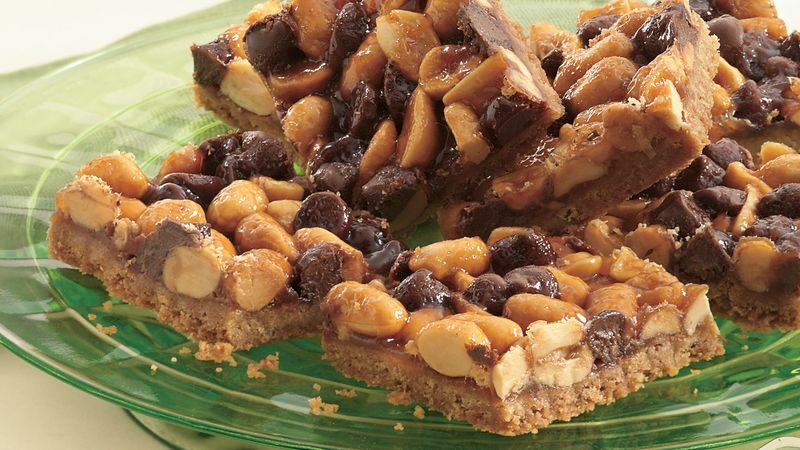 Drizzle evenly over chocolate chips and peanuts. Return to oven; bake 12 to 18 minutes longer or until topping is set and golden brown. Cool completely, about 1 hour. Cut into bars. For easy removal from the pan, arrange the toppings to within 1/4-inch from the pan sides.